Floating solar or an array of solar panels set up on a structure that floats on a water body has long been viewed as an advantage over ground mounted solar plants owing to its cooling effect and unavailability of land. With the technology recently making its way to land-starved Uttar Pradesh with Shapoorji Pallonji winning a bid to develop a 50MW floating solar plant in the country’s largest reservoir Rihand dam in Sonbhadra district, it could prove helpful. The firm won the bid last week at a tariff of Rs 3.29/kWh. With the auction tariffs capped at Rs 3.32 per unit, it was broadly aligned to the tariffs that have been bid for the projects on land in Uttar Pradesh. Floating solar makes intuitive sense in geographies with high land costs and poor availability. For instance, the water surface leasing component in this auction amounts to 5 paise per kWh generated, to be paid directly to Uttar Pradesh Jal Vidyuth Nigam Ltd (UPJVNL), the dam’s operator. The auction comes with no additional subsidies and allowances and with all capital expenses expected to be borne by the developers in full. Environmental clearances are, however, exempt. The power is to be purchased directly by the state discom through an escrow. The fact that floating solar can play a more significant role became apparent when Solar Energy Corporation of India (SECI) issued an Expression of Interest last year to develop 10-GW solar power plants across the country. However, the UP auctions are the first definitive marker for a dramatic shift in scale. The largest floating solar plant to date is a 2MW one in Vishakhapatnam. Another is a 500-kWh plant built by the Kerala State Electricity Board at the Banasura Sagar Dam. 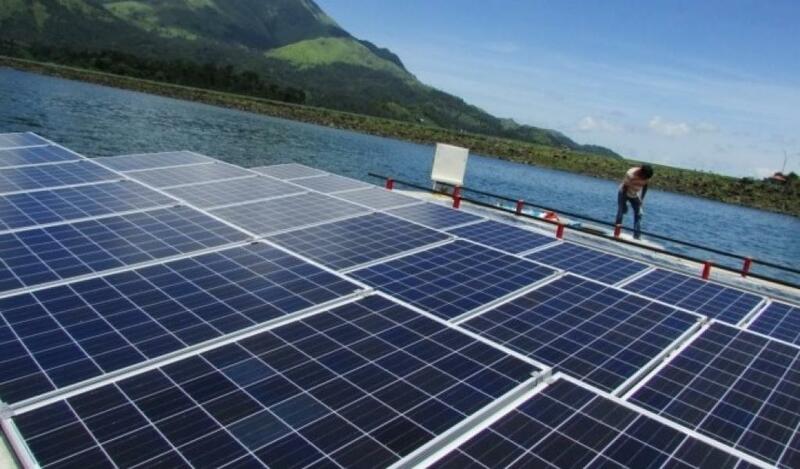 The global floating solar market is driven by Asian countries, with China and Japan being home to bulk of the existing operational capacity of 259 MW, according to Scandanavia-based Multiconsult, an engineering consulting firm. In India, floating solar is likely to face challenges scaling up to the level of ground-mounted plants. For one, it is clearly more expensive. The tariff for large scale solar around the country is well under Rs 3 per kWh. The higher tariffs is UP is partly due to higher land costs – there isn’t a lot of waste land available for the taking in the highly fertile, populated state. The premise of floating solar—the lack of land related expenses—is not that simple. The floating platforms, on which the plants are mounted on the water surface, and anchoring to keep the plant fixed over the fluid, is estimated to be more than 20 per cent of the total plant CAPEX. This is when the land costs for large scale solar plants in the country averages under 7 per cent. It is also unclear if there is an indigenous manufacturing base for the floatation devices. In an interview to a publication in July 2018, Anmol Jaggi, director at Gencol, pointed out that floating devices were difficult to transport incurring costs that are five times that of the solar panels. While NTPC did develop its own floatation device for its 100kW plant in Kerala, it is unclear if domestic R&D efforts can quickly expand to deliver the envisioned 10GW. That being said, floating solar is a definite reprieve for states that are a significant market for more renewable energy but with little land to spare, as is the case with Uttar Pradesh.